Our Ninjas 8U Black team took first place in their age group's fundraising contest for their PINK tournament last weekend, and Ava Mayer took individual honors for her age group as well. The Ninjas raised $3118 for this wonderful cause. Congrats to Ava Mayer, all of her teammates, team parents, and Manager Brian Mayer and his coaching staff for a great job. 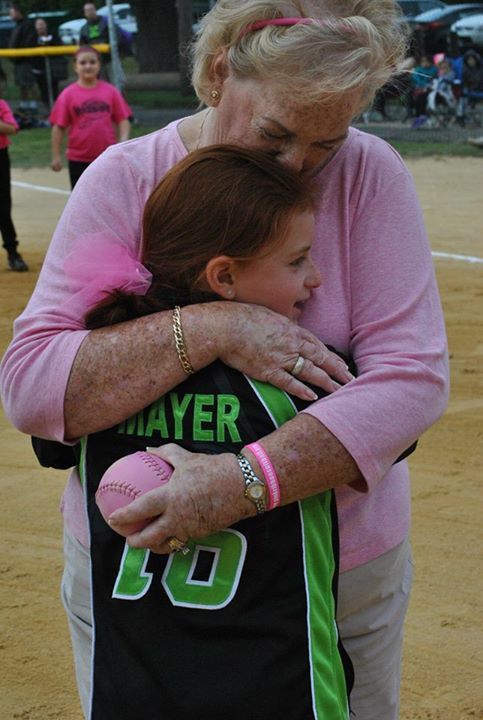 Here's a photo of Ava being congratulated by her grandmother, Nancy Macfarlane, a 19-year cancer survivor. Below that is are the results of the fundraising contest; lots of great organizations participated in this event. The Pink Ribbon Softball, Inc. proudly announces the 2014 PINK Tournament Fundraising Contest winners. The 2014 PINK Tournament Fundraising Contest Team winners will receive their awards at the tournament check presentation ceremony (additional email invite to follow). The winners will also be posted on the Pink Ribbon Softball web site - www.pinkribbonsoftball.org, as well as the Pink Ribbon Softball Facebook page. Congratulations to each of the winners! Your players have made outstanding fundraising efforts and they should be very proud of themselves. Thank you all for your tremendous efforts!